Our 11-week Spring sesssion will start on April 6. Registration is now open! Join us for a Trial Class! Reserve a spot in a free trial class and see what Music Together is all about before you enroll for a full session! Coming Soon - Our new website! Music Together of Bay Ridge will soon be updating our website design to match the new look of Music Together Worldwide. Same great program and teachers - just a fresh new look! Our phone number, 718-499-2866, can receive voice calls and texts! 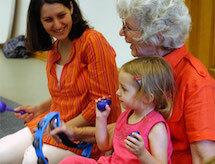 Our newest program -- "Rhythm Kids" for ages 4 - 6. Lots of drumming, and new songs and rhythms from around the world. If you miss a class, don't worry! It's easy to make-up missed classes any time during the session! We are excited to announce our newest location serving Marine Park and Midwood! Madison Jewish Center at 2989 Nostrand Avenue near Ave. P. Come try a class! We've heard your requests! We now offer Monday, Wednesday, Thursday, and SUNDAY classes in our Sheepshead Bay location -- 1635 Sheepshead Bay Road (near East 17th Street) serving Sheepshead Bay, Manhattan Beach, Gravesend, and Marine Park. We are always on the lookout for talented and dedicated teaching artists. If you might be interested in joining our teaching staff, please let us know.